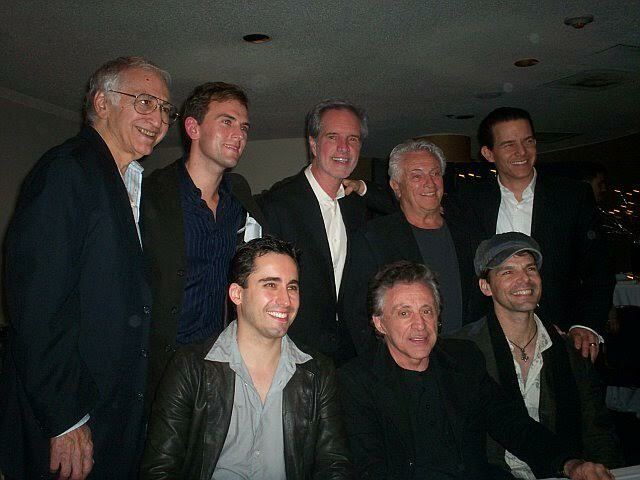 Let’s go back to October 21, 2007 at the BC/EFA fundraiser at the Broadway Lounge at the Marriott Marquis Hotel! Tony Award winners John Lloyd Young and Christian Hoff, Daniel Reichard and J. Robert Spencer came together with THE FOUR SEASONS (Tommy DeVito, Bob Gaudio, Joe Long, and Frankie Valli!) for an evening of conversation, cocktails and hors d’oeuvres–and a fabulous silent auction! A night we will NEVER forget! Share your memories of one of the most fantastic evenings in JERSEY BOYS history! I remember this night was organized by our illustrious fan leader at the time, Irene Eizen and was a benefit for Broadway Care/Equity Fight Aids. I could only pop in to the party for a brief moment as October 21st is my birthday and I had to make the curtain for Spamalot which was another hot show at the time. I bumped in to Damaris Dugan and her husband Joe in the lobby and then went up to the rooftop lounge where the party was taking place and I saw Frankie Valli grazing a buffet table all by himself. I couldn’t believe I was at a party with Frankie Valli! Ran in to Dom Nolfi who is always so charming and met Travis Cloer for the first time. JB was a hot ticket at the time and it was kinda fun to be “in the mix” even for a brief moment. Thanks Irene and Buz!